What's better than Nick's Law? This $5 million school-choice tax credit, signed into law yesterday by the governor of Arizona, is named after Lexie Weck, a seven-year-old girl with autism, cerebral palsy, and mild mental retardation who attends a small private school in Tempe that specializes in working with autistic children. Great column by Brendan Miniter in today's Wall Street Journal. Education scholar Andrew J. Coulson has looked at the latest data from the National Assessment of Educational Progress, and says they "reveal a productivity collapse unparalleled in any other sector of the economy. At the end of high school, students perform no better today than they did nearly 40 years ago, and yet we spend more than twice as much per pupil in real, inflation-adjusted terms. I can't think of any other service that has gotten worse during my lifetime. Our school system has failed alone. Michael J. Petrilli highlights some findings from The Condition of Education 2009. As of spring 2007, an estimated 1.5 million, or 2.9% of all school-age children in the USA, were home-schooled, up from 1.7% in 1999. Oklahoma Virtual High School enrollment could grow by 20 percent to 30 percent in the coming year, one official said. Enrollment is open now for the coming school year, the fourth year for the school, said Andy Scantland, vice president of marketing for Advanced Academics, the company that runs the school. In the past school year, the program had about 1,000 students across the state, he said. "Online learning is becoming more accepted," Scantland said. "Online learning isn't for everyone, but if you're someone who needs a different approach, this might be an option." In a letter to the editor published Saturday in The Oklahoman, public-school math teacher Robert Hanna expresses skepticism that a school-choice tax credit can increase per-pupil funding while saving taxpayers money. I would encourage Mr. Hanna to take a look at this spreadsheet tool (or design a better one himself), and then share with readers whether or not school choice does indeed save money while increasing per-pupil funding. If he'll write to me (schoolchoice at ocpathink dot org), I'll be happy to post his findings here. ... by the public-school environment, according to a new study. Using data from the Schools and Staffing Survey, a major national survey of teachers conducted by the U.S. Department of Education, the Friedman Foundation discovered that private school teachers have higher job satisfaction, greater autonomy, and more support than their public school counterparts. Advice from Checker Finn and from The Heritage Foundation. "In order to facilitate quick and effective communication among parents and school staff when dealing with rumors or emergencies, hundreds of schools across the state of Oklahoma have implemented the SchoolReach Instant Parent Contact system," Earth Times reports today. The system performs extremely well in emergency situations, like lockdowns, when every second is critical. ... "These deployments are part of a growing trend in school security and crisis management among Oklahoma schools," said Paul Langhorst, vice president of operations at GroupCast, SchoolReach's parent company. ... Enid Public Schools (EPS), for example, implemented the system in February 2007 after having to deal with several bomb threats that turned out to be pranks. "Children with disabilities are being secluded from classmates and restrained against their will to control their behavior, a new investigative report finds -- interventions that have led to harm and, in rare cases, deaths," the nation's largest newspaper reports today on its front page. "In many cases, the restraints happen even when students aren't physically aggressive or dangerous, says a report from the Government Accountability Office being released Tuesday." Education researchers William G. Howell of the University of Chicago and Martin R. West of Brown University have released newly compiled evidence from the 2008 Education Next/PEPG survey which shows that if the public is given accurate information about what is currently being spent on public schools, their support for increased spending and confidence that more spending will improve student learning both decline. And they find that knowing how much the average teacher earns lowers support among the general public for salary increases. According to the 2008 national survey by Education Next and the Program on Education Policy and Governance (PEPG) at Harvard University, most of the public has an inaccurate picture of how much is spent on public schools and how high teacher salaries are. Most are also inclined to support increases in both. Writing 12 years ago in The New Democrat, Tom Mirga, a former news editor at Education Week, observed that "if a public institution cannot be reformed in 15 years for $100 billion, it is fair to conclude that it cannot be reformed at all. ... If the education establishment continues to defend pumping more money into an indefensible system, it will surely lose the voucher battle and thus ensure the demise of public education." In a somewhat similar vein, today in The Oklahoman I suggest that the OEA's latest money grab would be bad for the state but (ironically enough) could be good for the prospects of school choice. The state's most powerful labor union is pushing a constitutional amendment which would require Oklahoma to meet or exceed the regional average in per-pupil expenditures. "Polling shows that initial support for the measure is strong," the state's largest newspaper pointed out today. "This will quickly erode as voters grasp how devastating it would be." Some voters have already grasped it. And not just conservatives. The president of the Oklahoma City affiliate of the American Federation of Teachers, AFL-CIO, has already warned of the damage HOPE would cause. So has another staunch public-school booster, an esteemed Oklahoma economist who warns that HOPE's baleful consequences would be "profound and lasting." Comes now state Rep. Scott Inman (D-Del City), a school-choice opponent and a strong supporter of public education. Rep. Inman was recently chosen by House Democrats as their next leader designate, succeeding House Democratic leader Danny Morgan. Peter J. Rudy of Oklahomans for Responsible Government reports that today in legislative debate Rep. Inman said he opposes the HOPE initiative. Expect more opposition, especially from the left, as the 2010 vote on HOPE draws near. 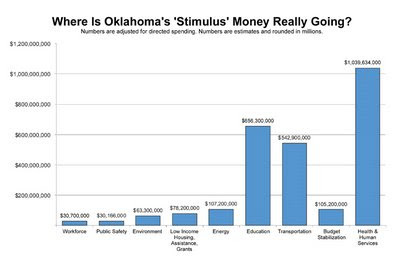 According to the Oklahoma Recovery & Reinvestment website, which aims to "ensure full transparency and accountability" with regard to the use of Oklahoma's so-called stimulus funds, $316.8 million of Oklahoma's $2.6 billion in "stimulus" money is going to education. With proper respect, I would suggest that the government's "full transparency" could stand to be a little fuller. For as this chart prepared by OCPA research fellow Steve Anderson indicates, the amount going to education is not $316.8 million; rather, it is more than twice that amount. How so? It turns out that the feds have directed the bulk of the money in the "budget stabilization" category to be spent on common and higher education. "A friend of mine went to his first day on the job at the United States Department of Education," writes Dr. Janice Shaw Crouse, "and was chagrined to see a sign on the door warning, 'The door be broke.' That sign is emblematic of what's wrong with education in America." "Al wanted to find how much his cat weighed. He weighed himself and noted that the scale read 57 kg. He then stepped back on the scale holding his cat and found that it read 62 kg. What was the weight of the cat in kilograms?" Only 60 percent of American students received full credit on their answers. There is a current level of protection for teachers that is enjoyed by no other class of employees in any other business. The cost of terminating one teacher in Union exceeded $65,000 because the trial de novo benefit automatically takes such cases to district court. Oklahoma teachers are tenured earlier than in many other states and there are few reasons available in law to replace them with higher quality instructors. The nation's largest newspaper reports that more black lawmakers are embracing school choice. Is Congress moving toward nationalized standards? On Wednesday, April 29, the U.S. House of Representatives Education and Labor Committee held the 111th Congress's first hearing on the potential reauthorization of the Elementary and Secondary Education Act (also known as the No Child Left Behind Act). Entitled "Strengthening America's Competitiveness through Common Academic Standards," the hearing could foreshadow a serious threat to the freedom of homeschoolers nationwide and America's constitutional tradition of limited government. While not connected with any bill yet proposed in Congress, the U.S. representatives on the committee dedicated the hearing to the discussion of a plan to potentially eliminate virtually all state control over the education system, and centralize education in Washington, D.C. through nationalized standards, which would lead to nationalized curriculum tests, and textbooks. Will Southern Baptists lead the way? Morris H. Chapman is the president and chief executive officer of the Southern Baptist Convention Executive Committee and one of the most influential leaders in the SBC. In a very important new article, Dr. Chapman proposes that perhaps "our focus in the evangelical community should shift at least in part from training our children during the transition to adulthood to placing greater emphasis on training up a child in the way he should go." Do not misunderstand; I believe the primary responsibility for raising children is charged to parents. However, it is undeniable that the church is charged with training parents and working with them to ensure tender shoots survive when moved from the greenhouse to the harshness of the natural environment. To be sure, there are a number of areas where Kingdom education at this level would be a welcome alternative to public schools. Many of our inner cities are suffering from failed families and failing students. In Baltimore, Md., for example, schools are experiencing dropout rates up to 60 percent; 70 percent of teens are sexually active; and, the city has alarming rates for crimes, sexually transmitted diseases and out-of-wedlock births. The focus should not be to abandon public schools, but to be certain not to abandon our biblical responsibility to come alongside parents in training up a child in the way he should go. Can we ignore the enormity of this need any longer when our children so desperately need to be fortified with strong biblical precepts as well as history, grammar, literature, civics, math and science? In recent days, two questions have weighed heavily on my soul. If Southern Baptists don't do it, who will? If we don't do it now, do we risk forever losing the opportunity to build schools for God's glory and the future of our children, grandchildren and the land we love? Economist Thomas DiLorenzo, author of the book How Capitalism Saved America, today demonstrates that anyone who argues there has been too little regulation of financial markets "is either ignorant of the truth or is lying." I will cheerfully give the benefit of the doubt to Tahlequah schoolteacher Chuck Pack, Moore schoolteacher Jill Dudley, and Oklahoma labor union staffer Linda Hendrix. I assume they are simply ignorant of the truth, and invite them to revise their remarks after further study. That's how much the Tulsa school district paid its attorney to fight the state's charter school law. "We think President Barack Obama and Congress made a poor decision in ending a voucher program in Washington, D.C.," The Muskogee Phoenix editorializes. We do not support a comprehensive voucher program as some propose, giving all parents and their students vouchers that allow children to attend any school their families choose. ... But we like the voucher plan Obama wants to end. It gives promising students whose parents are involved in their children's educations the opportunity to go to schools that will challenge them and develop their special talents. ... is either pregnant or has already had one or more children, reports Teddye Snell of the Tahlequah Daily Press. On the bright side, pregnancy does make a student eligible for homeschooling. "When a student becomes pregnant, she becomes eligible for home-bound services," says school principal Jeff Thorne. In a new book entitled Schoolhouses, Courthouses, and Statehouses: Solving the Funding-Achievement Puzzle in America's Public Schools (Princeton University Press, 2009), Eric A. Hanushek and Alfred A. Lindseth argue that increased spending on education is not resulting in increased student achievement. "For more than thirty years, student achievement has remained flat, even as education spending, adjusted for inflation, has almost quadrupled," they write. Even though the United States outspends almost all other developed countries on education by a wide margin, American students continue to achieve less than their international counterparts. Since 1970, the high school completion rate has remained flat. The college attendance rate has increased, but the college completion rate has leveled off, suggesting that more and more students are entering college unprepared and end up dropping out. This level of unpreparedness is reflected by the increase in the number of remediation courses offered in colleges across the United States. ... I think that there is probably a special place in hell reserved for politicians who betray our nation's most helpless children for the benefit of a sullen and recalcitrant teacher's union. There they spend all eternity explaining to their victims why they couldn't possibly have risked their precious babies' future in the public school system, yet felt perfectly free to fling other peoples' children into it by the thousands. Mary Anastasia O'Grady profiles the new spiritual leader of New York's 2.5 million Catholics. Does Obama care more about black criminals than black schoolchildren? No, Jason L. Riley writes. "He just cares most about not upsetting a hugely important liberal special interest group that helped elect him and other Democrats. The raw political calculation is that poor black parents will forgive him long before the National Education Association does." There's an excellent house editorial this morning in The Oklahoman ("Rescue plan: Obama should bail out D.C. vouchers"). Hats off to the state's largest newspaper for covering this important issue. Education is also a hot issue in the center-right blogosphere today, second only to swine flu. And in terms of hot trends, "school choice" is second only to "Patriot Act" today. The inimitable John Taylor Gatto taught for 30 years in public schools. He was thrice named New York City Teacher of the Year, and also earned New York State Teacher of the Year honors. Earlier this month, district officials finished installing new security features at [Clegern Elementary School]. Features include a new camera surveillance system and new pass keys to gain entrance to the school at 601 S Jackson. Bill Powell, the school's principal, said the system has taken some getting used to, but it has made his school safer. "This is a very, very secure school now," he said. After classes start, all doors to the school automatically lock. People inside can walk out, but the doors will remain shut to those without a pass key. Visitors must now identify themselves and wait to be buzzed in before they can access the school. The photo accompanying the story is priceless. The warden principal at this elementary school has a smile on his face ("Ain't this dandy?") as he demonstrates the boffo new security system. 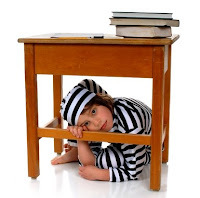 Horace Mann himself called school "the best jail" to his financial backers, by which he meant that the jail you sentence your mind to when you go to school is harder to escape than any iron bars. But as Mr. Troy probably knows, the twain meet all the time. Examples are numerous. News stories about Oklahoma’s pre-kindergarten (four-year-old) education program casually incorporate by reference sites where “free” (i.e., tax-financed) pre-K schools are being offered. Many stories include information about church-affiliated or other private providers receiving public support for providing pre-K care of one sort of another. As for elementary education, consider the ubiquitous federal Title I program, which has for decades provided remedial services to children who live in high-poverty areas and who are failing (or are at risk) to meet core achievements. Under Title I, public school district officials are directed to consult with private schools on delivery of services. Private schools in Oklahoma utilize Title I services in varied areas. Funding is driven by the “proportion of private school children from low-income families residing in participating public school attendance areas.” The law requires equitable services, not lesser services, for private school students. In recent years, the Bush Administration's No Child Left Behind Act established provisions for “supplemental services” that go directly to children, whether provided by a public or a private entity. Students enrolled at failing public schools can receive extra academic help – tutoring, computer-assisted education and similar things – outside the normal school day. Parents can pick the service from a state-approved list, and school districts pay providers directly. So far, most services have been provided by for-profit vendors rather than private schools, per se. In Oklahoma City and many other public school districts, taxpayer funds are used to pay private vendors who provide online courses, often for students who are failing in traditional classrooms. Privately run online course work has become common for public school high-school age children who need alternative instructional approaches. As public school populations fluctuate or decline, sites no longer needed for schools are often leased (and occasionally sold) to private businesses or institutes. In Oklahoma City, groups like the Eagle Ridge Institute, which provides special services for troubled youth, have received bargain rates because of the recognized value of the work they do with young people. At the higher education level, Pell Grants are the best-known federal program supporting students, based on economic status. As the name implies, this is an outright grant disbursed through participating institutions (public or private). College students can get $4,000 or more a year and never have to pay it back. It is usually limited to undergraduate studies, but exceptions exist. Some students use Pell Grants at a public institution and later at private schools, and vice versa. The program has empowered millions of lower-income Americans to pursue their dreams of education. Federal loan programs – Stafford Loans are probably the most widely utilized – allow qualifying lower- or middle-income students to access below-market interest rates, with no loan repayment until education is completed. The Stafford program also works directly with private loan alternatives, the feds' involvement reducing risk for lenders. In our state, the Oklahoma Tuition Equalization Grant (OTEG) Program, coordinated by the state regents but with decision-making centered in educational institutions, provides grants of up to $2,000 a year to qualifying residents who choose to attend private not-for-profit colleges. These institutions are usually but not always church-affiliated. The Oklahoma Higher Learning Access Program (OHLAP) got a funding boost in late March, when state legislative leaders announced they would channel an additional $5.5 million into the scholarship program assisting students who complete core curriculum requirements. Also known as “Oklahoma's Promise,” OHLAP is available for students attending either public or private universities and at career tech centers working with public two-year institutions. In short, taxpayer resources fund educational services in varied ways, and every day millions of public education dollars flow to private vendors or entities. That is a fact, not an opinion. And I've merely scratched the surface of government programs that assist parents and students in making educational choices. Other examples of public dollars financing private delivery of services across all age levels are far too numerous to belabor here, including but not limited to: Head Start and early Head Start, child care assistance, and public-school food services, custodial, maintenance, transportation, and security personnel. Whether or not federal, state, and local lawmakers want to allow further experimentation with privatization of educational services is a public policy question, not an outcome dictated in advance by any one faction. But let’s make no mistake about this: Whether it’s educating toddlers or twenty-somethings, public dollars flow to private schools all the time. ... when we long ago socialized the most important industry of all? "Disruption, in the form of online learning, is beginning to sweep through U.S. education," write Clayton M. Christensen and Michael B. Horn, coauthors of Disrupting Class: How Disruptive Innovation Will Change the Way the World Learns. "At a growth rate of over 30 percent per year, online learning has the potential to bring true choice to millions of students and their families by delivering individualized learning opportunities not bounded by school or geography." I read the research literature to say that early education programs can probably make a marked improvement in the lives of disadvantaged children, but that we have only a partial idea of how they should be organized and managed, that is, brought to scale. As of now, there is no actual model of early education or preschool services that has been proven successful in closing the achievement gap, and any additional funding should be used to create a flexible system that can change, and improve, as more knowledge is accumulated. It is possible that the children from middle-income families might also benefit from preschool programs. The danger is that preschool will become a new middle-class entitlement, displacing the more intensive (and extensive) efforts needed to shrink the achievement gap among severely disadvantaged children. We need separate policies for each purpose, and bundling them together is a sure recipe for a new middle-class benefit that shortchanges the poor. ... that the hypocrisy meme continues to linger. ... at President Obama's sin against schoolchildren. And they made videos explaining why. People who are considering homeschooling often ask me if there are any books on the subject I can recommend. 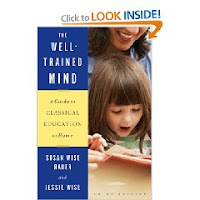 There is one book I always mention first: The Well-Trained Mind: A Guide to Classical Education at Home by Susan Wise Bauer and Jessie Wise. I reviewed the book favorably eight years ago in The Oklahoman. Over the weekend the mailman brought me a copy of the 10th anniversary edition. Susie and I have used the book as our road map from day one, and today I recommend it more strongly than ever. That's the message from the state's largest newspaper in a house editorial today. Those fighting to get that truth out in Oklahoma mustn’t stop, in spite of the governor’s veto of a measure to bring more transparency to the student achievement issue. As difficult as it may be to hear, it’s no more difficult than the reality students must confront when it becomes clear they’re prepared for neither college nor a decent job. School choice is Excedrin. "Equal opportunity in education" is the Excedrin headache. The latter compels the former. "Equal opportunity in education" is an idea whose time has come. Horace Mann, generally regarded as the father of America's current public school system, once prophesied: "Let the Common School ... be worked with the efficiency of which it is susceptible, and nine tenths of the crimes in the penal code would become obsolete; the long catalogue of human ills would be abridged." Mann would probably be surprised to learn that crimes are now occurring with such frequency in the schools themselves that two federal agencies see fit to issue an annual report on the matter. This year's report by the Bureau of Justice Statistics and National Center for Education Statistics, Indicators of School Crime and Safety: 2008, indicates that a higher percentage of students in public schools than in private schools reported victimization, theft, gang activity, hate speech, hate-related graffiti, and fear of being attacked or harmed at school. Zero would be a good number, Clint Bolick suggests.